Budgeting is a helpful and wise way to manage your money. There are biblical principles that can help you develop and use a Christian family budget. What does the Bible say about managing money and a Christian budget? Most people are familiar with the term budget, and many understand that budgeting is a smart way to keep track of their money. But how many actually use a written budget as a part of their personal or family finances? Not very many. Small and large businesses have and live by their annual budgets. Budgets help businesses know where they are, what they need to accomplish and where they can change to improve their financial standing. Therefore, budgets are required by boards of directors, shareholders, banks that give business loans and, in some cases, even the government as a qualification for certain types of programs. A budget is required because it makes good financial sense. Does it also make good sense for our families? When it comes to individuals or families, there is a greater tendency to let the budgeting thing slide. It may be seen as too much trouble or just not necessary—and as a result, many families find themselves in serious financial difficulties. Sadly, a major factor for the failure of marriages today is financial problems. How many individuals and families truly understand how to budget? Of those, how many have a balanced Christian budget? We use the term Christian budget due to the fact that there are sound scriptural principles that you can find in the Bible that can help you and your family become successful in managing your finances. “The plans of the diligent lead surely to abundance, but everyone who is hasty comes only to want” (Proverbs 21:5, New Revised Standard Version). A budget is nothing more than a plan for saving and spending money. It includes where the money will come from and how much to expect, as well as what expenses that same money will be used to meet. A good budget takes care of all the regular and important bills—like rent or mortgage, utilities, food, gasoline and insurance—and allows for the unexpected or occasional expenses. With budgeting, when the paycheck comes in, the family already knows how much of this check needs to be set aside to meet the bills coming due, and how much is available for extras—perhaps dinner out and a movie. Everything is planned for and covered. In the terms of the verse we just looked at, this kind of thinking is “hasty.” This describes a person who jumps at a purchase without a plan and without thinking through the consequences. Unless you are one of those rare individuals who makes more money than you can spend, you will need to develop a plan for where your money goes or it will slip out of your hands. Sometimes it will disappear in small amounts that add up quickly, maybe a candy bar purchase here, a newspaper there, a cup of coffee or some fast food. Supermarkets, convenience stores, fast-food chains and so forth are all successful in squeezing money out of you, especially if you have no budget—no plan. After all, it is only money, right? So we can see that it takes a plan to make our funds stretch to meet all our needs. This is where a Christian budget becomes a useful tool to receive God’s blessings as wise financial stewards. Through proper planning, it is possible to have a balanced budget and to have a reserve for unplanned expenses. God’s Word, the Bible, is filled with principles of sound financial management. Wise King Solomon wrote: “Be diligent to know the state of your flocks, and attend to your herds; for riches are not forever, nor does a crown endure to all generations. When the hay is removed, and the tender grass shows itself, and the herbs of the mountains are gathered in, the lambs will provide your clothing, and the goats the price of a field; you shall have enough goats’ milk for your food, for the food of your household, and the nourishment of your maidservants” (Proverbs 27:23-27). The principle is that of a wise overseer. It isn’t always easy to wisely use and manage family assets. It will require not only planning, but self-discipline to stay within the budget. It will probably involve putting off some purchases until later or deciding against others entirely. But men and women who can wisely and carefully manage their resources can successfully see to it that the family needs are met. One challenge some face is: “What if my income is not easily predictable?” Many people earn commissioned sales, and they face this very problem. Let’s draw a lesson from the way a business handles this dilemma. Since most companies generate their revenue by selling goods or services, they can’t know with certainty exactly what they will earn each month. So they must create a proposed or projected budget. They evaluate their past months of business income and expenses and propose an estimate for the following year. And as they go along, they have to make adjustments as income and expenses vary from the estimate. The same approach can be applied to a Christian budget. Regardless of whether you work on commission or know exactly what your paycheck will be, let’s start at the beginning of how to budget. Following are the important elements that will assist you in developing a Christian budget for you or for your family. 1. Budget together as a family. If you are married, it is extremely important that you and your spouse plan the budget together. Imagine what a tremendous teaching example this can be for your children! 2. List all of your expenses. 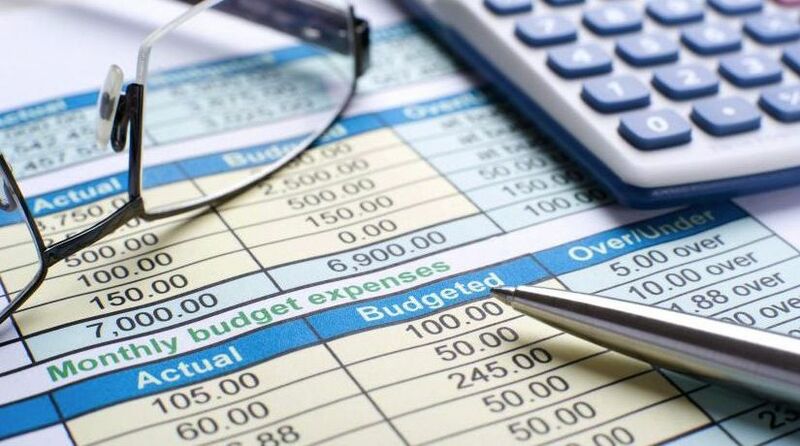 In order to understand a budget, you must know exactly what you are spending. Sometimes a husband and wife can lead separate lives financially and have no idea what the other is doing. If credit cards are abused, expenses can careen out of control, leading to painful experiences in debt. For a budget to work, both husband and wife must be honest about expenses. So, take a sheet of paper and list your expenses. If you do not have a steady income or if you are at a place in your life where the outgo is exceeding the income, use this process for prioritizing your needs. When one is “down in the dumps” and without a plan, it can be easy to spend recklessly. 4. Learn to say “No”! It may not be easy, but learning to say no will go a long way in helping to balance a Christian budget and avoid the trap of excessive debt. If it isn’t in the budget, then it shouldn’t be purchased at this time. It all seems very enticing—and even more so when it means that new car, flat-screen TV or living room furniture can be yours today! But should they be? Why wait? The answer is found in the Scriptures: “The rich rules over the poor, and the borrower is servant to the lender” (Proverbs 22:7). The deeper in debt we become, the greater the problems for our budget and family finances. “Just say no” applies to more than illegal drugs! 5. Increase your education. Most of us would like to make more money than we do. Would your income improve if you were to get a degree, trade certification or learn a new skill or trade? It may not be possible to go back to college and get a degree (or it may take years of night school), but there are other ways to make yourself more valuable to an employer. Take advantage of continuing education programs that may be offered by your company or in your profession. Study and seek more advanced certifications in your field. Perhaps apprentice under one more knowledgeable and skilled in your field, or seek such a person as a mentor. King Solomon once wrote, “Get wisdom! Get understanding! Do not forget, nor turn away from the words of my mouth. Do not forsake her, and she will preserve you; love her, and she will keep you. Wisdom is the principle thing; therefore get wisdom. And in all your getting, get understanding” (Proverbs 4:5-7). In the working world, wisdom and understanding require education. Investing wisely in your education may be one of the best financial investments that you can make. Turning your situation around may be a difficult process, but in addition to the wise principles of Scripture, there are numerous resources available to you. Solomon also wrote, “Without counsel, plans go awry, but in the multitude of counselors they are established” (Proverbs 15:22). Your budget is the plan; and if you need help, seek the guidance of a wise and understanding counselor. Seek the advice of an experienced family member, successful businessperson or even a debt counselor. Those counselors can help you set a budget; manage your income, expenses and debt; and help put you on the road to taking care of your family in the best way possible. A successful Christian budget is one that follows some basic principles and guidelines found in the Scriptures. To properly manage the family finances may require a different mind-set than many in our society have. Working together as a family, you can create a budget that will provide a plan of action, a goal to look forward to! “May he [God] give you the desire of your heart and make all your plans succeed” (Psalm 20:4, New International Version). See more on Christian budgeting in the “Finance” section.